I’ve had fun putting together two pouring activities for preschoolers. Both activities are red, which is great for a number of themed activities – whether it’s for the color red, apples in the fall, Christmas, Chinese New Year, Valentine’s Day, Heart Health Month, or patriotic holidays. Many Montessorians simply have materials on a tray that are primarily one color (not according to a theme) to make it easier for children to return materials to the proper tray. 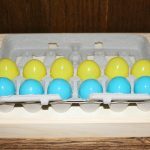 I generally followed that tradition as a Montessori teacher and homeschooler whether or not I was using a theme. Disclosure: The materials in this post were given to me to review for giveaways. My opinions are all my own. This post contains affiliate links (at no cost to you). This activity was one of the easiest activities I ever prepared. 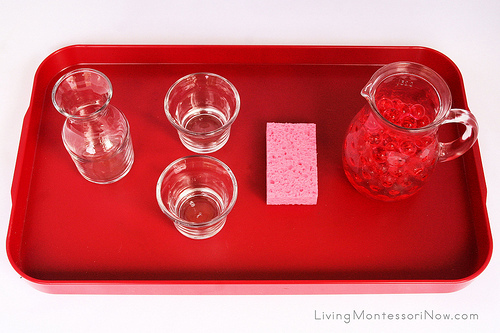 Since I had the Montessori Services Pouring Water Exercise 3: Basic Pouring Activity, everything was included except the water. I just added some food coloring to the water so that it coordinated with the red tray. I love the set, but I especially love the large plastic tray, which I’ll use for activities of all kinds. Montessori Services specializes in practical life materials, including lots of other pouring sets. Whether you like purchasing complete sets or individual items, their prepared sets give some great ideas. 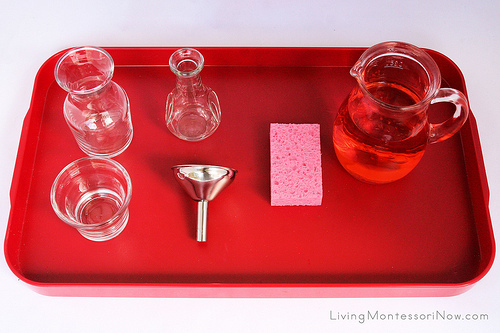 For this activity, I used the same red tray and some of the items from pouring water exercise 3. I just added an oyster cup from the Small Tongs Activities. 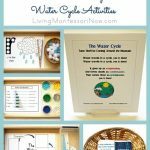 I’ve always loved the way Montessori Services trays and other materials can be used for a wide variety of activities. 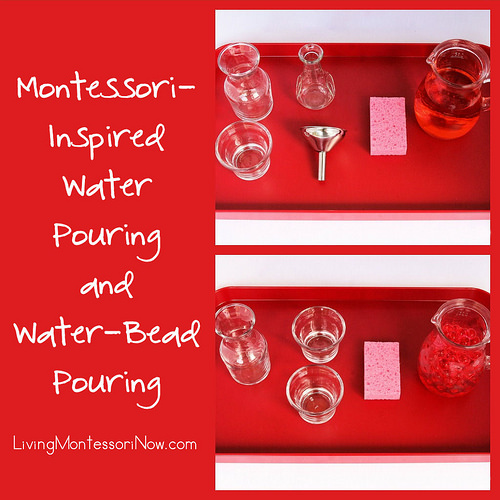 I LOVE water beads, so I used a mixture of water beads and water for this pouring activity. It makes the pouring activity more challenging … and who can resist pouring water beads?! 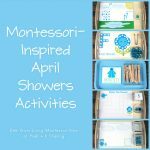 The Montessori Services prepared sets come with presentation ideas. 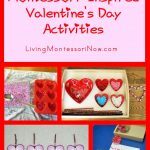 In my Montessori Practical Life Activities post, I have links to some free Montessori online albums. I really recommend owning the Montessori Print Shop Teaching Manuals (link is to my review of the Montessori Print Shop AMI albums). 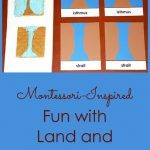 If you’re a homeschooler who’d like an affordable but complete course with 12 AMS albums, check out KHT Montessori’s online Montessori training. 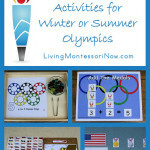 Be sure to see my post with links to my Montessori Services product reviews. Do your children or students have favorite pouring activities? Never mind the kids – I want to play with them every time we get them out! Such a great activity for little hands. My 5yo daughter loved this activity! Really love your red theme for the activity, Deb. Not only does it make the activity more appealing it also looks vibrant and more fun! With some tips and advice from Marnie over at Carrots Are Orange (via FB), I set up a system for my 3 year-old to scoop his own cereal and pour his own milk from a small pitcher like the one you show here. It has bolstered his self-esteem/confidence and made him love breakfast! I think he would love a pouring activity like this too! My little guy loves pouring water, so I am sure he would enjoy pouring water beads (when he isn’t throwing them around). We will have to try next time we get them out! These are beautifully put together, Deb! I had never thought to use water beads in a pouring exercise. Brilliant idea! What a great idea! I bet pouring the water beads would be tricky. Two great activities that I would love to try. Thank you for sharing at Sharing Saturday! What a lovely activity! And I can just hear the tinkle of the water beads on the glass!) Nice!